Preschool security is of utmost importance to us at FBCR. Come to the Check-In Zone desk in the Building for the Generations to fill out your child's preschool security label. Feel free to speak with the preschool security team members for help on how to complete the Security Label. The Security Label is shown below. The entire label is peelable. The larger label is peeled off and attached to your child’s back so they do not remove it, and the label that says, "This bag belongs to" is attached to their backpack or diaper bag, if applicable. The part of the label that says, "Jesus Loves Children" is kept by the parent/guardian. The parent/guardian will bring the "Jesus Loves Children" part of the label to receive their child after class. If your child has allergies of any kind please ask a preschool secuirty team member at the Check-In Zone desk to give you a red dot sticker. Be sure to place the dot red sticker on your child's security tag to notify the teachers of your child's allergy. 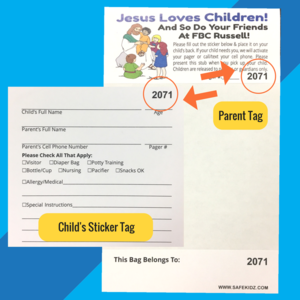 The Security Label is the source for matching you to your child.The Preschool Bible Fellowship teacher will only release a child to the person who has the Security Label with the matching number on the child’s label. Many of our children are dropped off at 9:00 a.m., and are not picked up until after the Second Morning Worship service (10:30 a.m. service). We have different teachers during each service. This is why this procedure is so important. If you should have any questions about this procedure, please feel free to contact Tina Sparks, Minister of Children and Families. She can be reached during church office hours, Monday through Thursday from 9:00 a.m. to 4:00 p.m. at 606-836-5111. Our goal is make FBCR the safest place possible for you and your child. We have the best interest of all the children in mind. We hope you see the value of our preschool system, and we thank you for working with us to ensure your child's safety.